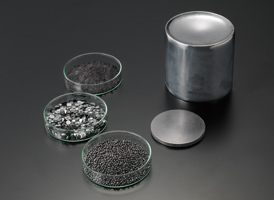 Products　セレン | Nippon Rare Metal, Inc.
Selenium is used for digital X-ray sensor in the medical diagnosis equipment such as mammography, and is now focused for the application of CIGS (Cu/In/Ga/Se) compound solar cell. NRM's Selenium, which is produced from the know-how accumulated over the past few decades since its foundation, will provide the users with the highest potential properties. The ability to precisely dope with such elements like As, Cl, Te and alkarine metals in the unit of ppm to % order and stable and constant supply are the remarkable advantages of NRM technology. Copyright ©2014 Nippon Rare Metal, Inc.